At the Seaport Place Parking Garage, we've created special parking programs to make parking in South Boston more convenient and an even better value. The Monthly Parking Pass is our most popular Boston parking program. Enjoy guaranteed and unlimited access to the parking garage - 24 hours a day, 7 days a week. Even when the Seaport garage is otherwise full, we will always have a place for your vehicle. Seaport Parking works on a calendar month. Prorated amounts will apply for all monthly programs that start after the first of the month. Click here to sign up for Monthly Parking. Allows you to park during evenings and weekends, this reverse commute program is perfect for evening employees and neighborhood residents. With Overnight Option 1, you will enjoy access Monday to Friday from 3:30 pm to 9:30 am the following day, as well as free access on the weekends - for $130 per month. Option 2 provides similar access, Monday to Friday from 2:30 pm - 9:30 am plus free access on the weekends for $150 per month. A convenient solution for Seaport office tenants, Pre-Paid Tickets are easy to hand out to employees, clients or visitors. Each ticket is valid for 24 hours of parking. Pre-Paid Tickets are sold in books of five for $125. 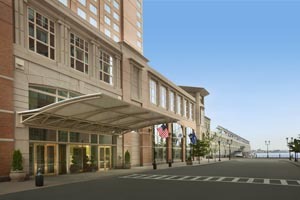 Purchase your tickets at the Garage Office in the Seaport Boston Hotel lobby, near the Bakery Café. Simply download the info you need. Completed parking forms should be brought to the Garage Office in the Seaport Boston Hotel lobby, by the Seaport Café, or faxed to 617-385-4158.